M I can’t say that I will miss what the film industry has become, which I hardly recognize. Not just because of the change to digital production and digital releasing, but because of the kind of movies that Hollywood is making these days. But what the industry has been—films made on films—has made my own work possible. No film industry to use the film that manufacturers make, then no film to shoot with; no film to shoot with, I and others like me can’t make movies. So ultimately I and people like me depend on the industry. We can’t make our own cameras and we can’t make our own film and film stock. The tools and materials we work with have been made possible only because there has been a film industry, a machine that has produced films on an industrial scale, a scale large enough to support the development and manfacture of the equipment and of film itself, the material stuff that goes through the camera and later through the machines in the lab when prints are made, and later through projectos. And of course I owe much of what I will call my subject matter not just to the material form of film that the industry has sustained, but to the conventions and equipment of Hollywood. Hollywood has certainly been one of my subjects. The film industry could disappear tomorrow and I would not miss it, or so I would like to think. The industry as it has existed—its technical means, which are tangible, and its conventions, which are abstract—would still be there for me to make use of. At least the technical means would still be there for a little while. Old movie cameras aren’t going to end up on the scrap heap, the way some editing machines have. So I could keep on making films, except of course without the industry, companies would no longer make film and there would no longer be labs to process it. So I could only go on making films for a little, until raw stock is no longer available and until there are no more labs that process 16mm, although perhaps artist-run labs could be a viable alternative. I simply don’t know. I think you know that recently Eastman agreed to keep on making 35mm stock, although I don’t know if it was raw stock or print stock, maybe both, only under pressure from high-profile directors in the industry. 16mm film does not have powerful friends to bring pressure on Eastman, so its future looks bleaker. I will keep on while I can. But what an awful thing to have to consider, that I better hurry up and make my films while I can still make them as films. To my knowledge there is no other art that has ever faced a comparable situation. I don’t yet miss the sound of the projector because I am still able to insist that my films are projected as what they were made as, films, even if projectors are becoming less and less the standard apparatus for projecting a moving image. And despite projectors’ gradual disappearance, there will still be specialist institutions that will have projection as I have always known it. They will have to; the preservation of projection will become a key part of their identity and their function. Yes, I will miss terribly the materiality of film, but by the time when the making of films as films and the projecting of them as films is finally no longer possible I will probably be dead. At least I hope I will be. So with any luck the moment you are describing will never come for me. It would be too painful to want to make a film, to want to realize a moving image work that for substantive reasons, not just reasons of nostalgia or inertia or habit, has to be made as a film and to find that it is no longer possible. M I hope you are confining this to the question of film, otherwise my answer would be the length of a book, a long one. But I will mention one thing apart from the world of film. I am shocked by how far to the right the political discourse in the U.S. has shifted. I miss how it was when I was a kid. It was bad enough then, but now it’s worse: what was then the lunatic fringe, which as a kid I didn’t know about, is now a part of mainstream discourse. But besides open racism and no pity for those who are the innocent victims that capitalism inevitably produces, there is now virulent reaction against the gains in individual rights: open homophobia, opposition to equal rights for women, including the right to birth control. All deplorable, and the Left cannot seem to find a way to fight back. You would think that the vitriol and anger coming from the Right would be easy for the Left to respond to, but for reasons not clear to me this has not been the case. M Well, there has been one film since Standard Gauge, and that was ( ), which I made in 2003. That was either a long time ago or very recently, my view changes back and forth. And there are some films I would like to make. There’s the one I mentioned, which when I got the idea seemed a little academic, I think the word would be, but with the waning of film no longer seems so. In fact it would be rather a polemical film. And there’s another, for which I have to write what I will say. Writing is such a headache, but I will get around to it. And maybe another after that. And there’s another that could be made as a video. It would be more satisfying on film, but it wouldn’t have to be. I can hardly believe that I am saying this. The title will be Another Movie. Its point of departure is Bruce Conner’s film A Movie, a great work, but in my view a problematic one. In any event I have never stopped thinking of myself as someone who makes films. Painting was my original interest, when I was in my late teens and early twenties, but it was in the early ’60s, a difficult time to have wanted to be a painter, even if you were sophisticated and attending an art school, and I wasn’t sophisticated and I didn’t attend art school. There aren’t many painters who emerged in the early ’60s whom we pay attention to today. I admired people then that I still do, like Pollock and Reinhardt, but I also had tastes that now are an embarrassment. I still have one painting I did then, a gouache on cardboard that owes a lot to Guston’s abstract work. Lots of impasto, not the best thing to do with gouache because it cracks. After I finished it I turned it over and moved a match around underneath it, so I couldn’t see what the flame was doing to the paint. So the colors are changed here and there and the surface is charred here and there, in fact burned through the first layers of the cardboard in a couple of places. I didn’t have the sense then to realize what I had done—working with chance, finishing a painting by damaging it—and that I should have done more like it. Or maybe the one was really all I needed to do, and then it was time to move on to something else, but at the time I didn’t. I made my first films in the late ’60s, during the time of minimalism and conceptualism. For me these together were a transformative moment. I would not be the only one to say that that moment in the late ’60s was of immense significance as the last moment when a broad movement of utterly new art emerged that had ambitions worth having and at the same time embodied formal intellectual rigor. I absolutely loved that work, almost all of it, and you can see this in the films. I consider myself extremely lucky to have begun my mature work at that moment. The installation work was the result of my wanting to move beyond the film world, but whatever you may think about that wish, I can say that in some of the work there were notions, mainly site-specificity and addressing the viewer as an embodied subject, that were later present in the paintings. As I was doing my work in film in the years that followed the late 60’s, I paid attention to what was going on in the art world, but my ideas were still film ideas. The painters I liked most were hard-core abstract painters: Ad Reinhardt, Blinky Palermo, Brice Marden, Ellsworth Kelly, Robert Ryman, and Gerhard Richter, although he’s something of a special case. I think of these painters as being rigorous, something worth emulating, but the question was how to find a way to even begin to do work that I could stand behind. It hardly seemed possible. In the late ’80s I started getting ideas for works that, if not paintings as such, were sketches of ideas for paintings, and this went on for some years. I accumulated lots of drawings on typing paper and on envelopes that I picked up out of the wastebasket. It was as if I couldn’t bring myself to sit down and work on a piece of serious paper, like Arches 100% rag paper. That would have been too inhibiting. An envelope that you pull out of the wastebasket and make a quick sketch on, really no more than a note for a painting in the form of a diagram with a note about colors, or a few strokes of colored pencil, was another story. I did do some work in gouache that was on more serious paper and accordingly was very deliberate, but there were only a couple and at least they weren’t oil on canvas. Then in the late ’90s, after a bunch of gouaches on serious paper, I had an idea for work that could only be realized as a series of paintings as such, as paint on panel as it happened, not on canvas, because the edges of the paintings were irregular. That was the real beginning. Then came work that was determined by the architecture in which it was shown, and all the rest. And as you know, the work is extremely simple, almost all of it monochromes. But it’s not as if I ever turned away from film, that is, thought of myself as no longer a filmmaker. It’s simply that I followed an interest that lead away from film while at the same time reserving, so to speak, my relation to filmmaking. And in fact I made ( ) in 2003, a few years after that first body of paintings. I had the idea years before, but I wanted to make it in 16mm. The film would consist of inserts from feature films which are made in 35mm, but are also released, or at least used to be, in what are called reduction prints, reduced from 35mm to 16mm, to show in prisons and in the military. I didn’t know how to find enough 16mm prints of feature films to gather enough inserts. Then along came eBay, through which I found almost all of the material that I worked with. But I mention again that I had the idea years before, perhaps 15 years before, maybe longer. I’m just lucky that no one else thought of it during that time. M If you mean the change from film to non-film, or more specifically painting, in relation to changes in the circumstances surrounding production in the general field of making visual work, I would say the answer is no. It’s not as if I turned away from film because it became difficult to make films as compared to making paintings or work of a related kind. Rather, I didn’t have film ideas, but I did have ideas for paintings, so I turned toward painting. And much of the paintings and other non-film work would have been difficult for me to make, owing to my lack of skill in carpentry and not having a studio, so other people have made them for me. In fact I did have an idea for a film that I did not pursue because it would have cost a fair amount of money to make it and I did not get the grant that I was nominated for. It would have been a documentary about Brecht’s play Galileo, which as you know was about the conflict between scientific inquiry and power. During the war Brecht ended up in Los Angeles, in fact he lived in Santa Monica, in a house a few blocks from where I lived at the time and which still stands. The first English language production was mounted in Los Angeles, and was directed by Joseph Losey. My film would have been a way of criticizing American scientists who were working on Star Wars, Reagan’s missile defense initiative, which when you look back on it was a technological fantasy. But it meant money for researchers, some of whom were at universities, so they were all for it. M If by “installation works” you mean the film installation works, I’m not sure I have a ready answer. Maybe the link is my wanting the image on the screen to be an invitation to think about issues beyond what is happening within it, such as the relation between the image and the situation in which you are as you watch it. That was already the case in Screening Room, which I made for the first time in 1968. It’s a conventional film in that it starts and then runs its course to the end, and it’s shown in a theater, but it tells you what most movies don’t, even relatively radical ones, that you have a body (or should I say “are a body”; if anything we don’t have our bodies, our bodies have us) and that you are sitting in a specific place, just the things that almost all movies are designed to keep us from being aware of. And Phi Phenomenon is similar in that it makes you aware of the passing of time and also of your body, which again almost all movies do their best to keep you from being aware of. But if by “installation works” you mean the non-film work that is installation-like, which I hope you would allow me to take as meaning almost all of the painting work, I think what they have in common is that they try to get rid of composition as that idea is conventionally understood—the artist making stuff up that is taken to express his subjectivity, as if we would find such a thing remotely interesting—and instead are constructed on the basis of things that are already in the world. A lot of the films, for example, use standard lengths of film as they come from the factory, so they accept the decision that the manufacturer made as preferable to, in fact superior to, a decision I would make about their length. Accepting the length of the roll frees me from having to make that decision, frees me from making a decision that draws attention to myself as the origin of the work, an embarrassment I want to avoid. And in most of the films there is no editing. Editing is a compositional procedure, one through which you control the viewer’s relation to the work, and shooting a film that consists of one shot does away with trying to control the viewer, at least in that way, the classical way, because, as Godard has pointed out, quite apart from the effects produced by editing, a shot is composed to create certain effects, which are comparable to the effects of editing, and what can be said for a shot can be said for an entire film that consists of only one shot. But at the same time it is possible to organize a shot in a way that renounces composition, as I have tried to do in many of the films, maybe most purely in Production Stills. As you no doubt know, someone other than me took seven of the eight pictures that the film shows us one by one. And the photographs one after the other are a repetition of the same shape, which we can call a module, one of the devices that are against composition. I can say that even though the film consists of only one shot, it certainly was not organized with a view to trying to control your relation to it—far from it. A lot of the paintings, not just their shape and size but also their placement, are determined by the architecture in which they are hung. Some of these paintings are made in multiple parts so you have to navigate, if that is the word, the relation between physically separate objects that together are one work. Some of the work of this kind can’t be seen from a single viewpoint, the usual condition for viewing a painting, instead it requires the viewer to turn this way or that, or even to walk around to see all of the painting’s elements. So instead of seeing all of the painting all at once, you see its elements one after the other, over time, and you have to remember what you have already seen to construct an understanding of how the parts are related to each other and so come to an understanding of the entire work. Paintings that are given their size and shape and placement by architecture undermine the autonomy that we assume is the case with painting, and these paintings in multiple parts do that as well by reminding you of the space through which you are moving as you come to one element after the next. To move you have to have a body, so your experience with the work is very different from a purely optical encounter with a painting as if nothing outside of it exists and as if you are without a body. Some of the paintings in multiple parts are organized on the basis of conventional color relations, as we find them in the color wheel or in relations between additive and subtractive colors. I didn’t invent these relations, I found them already existing in the world. All of this, as is the case with the films, is to make the work impersonal, to get away from what composition points to, the subjectivity of the maker. To put this another way, my work in painting has been against painting as a single autonomous object, painting as we have been accustomed to thinking of it, but which in my view for the moment has not been the basis of interesting work, and perhaps is not even capable of being the basis of interesting work, although I would be glad to be proven wrong, and of course in the years to come things could change such that painting as a single object could come back, although I don’t foresee what those conditions could be. I came to this view only gradually. It began with the fact that I made my first paintings as a group and I showed them as a group. At first I thought of them as individual paintings, but when the whole group was broken up, I insisted that the remaining subgroups stay together, either as pairs or as group of three. One painting by itself wasn’t enough. You needed several to tell you what was going on, to show you what was the same and what was different between them. Then I started making paintings in groups that I want to preserve as groups. There were paintings in multiple parts that together were a single work and paintings in multiple parts that together were a single work you couldn’t see all at once. The most extreme of this last kind was a painting in twelve parts. The work didn’t develop in the orderly way that this way of describing implies, but in effect that has been the trajectory. And so I finally realized that my painting was against the solitary autonomous painting. I cannot imagine even wanting to try to make such a painting, with a possible exception that is theoretical and so not worth talking about. But at any rate, to try to sum up, the idea of making work while trying to avoid drawing attention to myself as its ultimate origin, in fact as its author, is in general what all of the work has in common, whether in film or painting or in other media not in film. Of course the ambition is impossible because without me there is no work, but that is the ambition nonetheless, and trying to act on it at least expresses the wish to attain it even if it’s unattainable. The two kinds of work—the films and the installation work, however we may understand that word—can be divided, as you suggest, and there are real differences, but to me what is more important than the differences, which in any case are too numerous and too specific for me to deal with here, is that, as I have tried to suggest, across all of the work, despite the many differences, there is at bottom a certain continuity. M It is certainly an impersonal work, but I hope it does not represent the ultimate in the impersonal, because that would mean that since 1994 my work has become less impersonal, to me implying that since then it has all been downhill, downhill meaning not getting easier and gathering momentum toward an arrival at some glorious culmination but rather in decline. M If we were recording this, you would hear me laugh, a sort of gentle bemused laugh, laughing at myself with some embarrassment for this episode from long ago—the early ’70s, maybe a little later—and laughing that the story has circulated to the extent that you heard about it, and what’s more, remembered it. What you heard is partly true, but there is more to it than its being partly true and partly not true. It’s true about the shirt size, but it’s not true that the shirts were custom-made. A 16 inch collar and a 35 inch sleeve were a standard combination of sizes then and remain so today. I wonder if I would have made it a point to wear shirts that size if the coincidence with the two film gauges had been the only one, but in fact there was another coincidence with these numbers, and this second coincidence is probably what gave them the further significance that I felt I had to recognize. These two numbers, 16 and 35, play a part in isometric drawing, a technique I started using at the end of the ’60s for works on paper. Isometric drawing is a convention for pictorial drawing. It’s faster and simpler than perspective but not as illusionistic, because parallel lines remain parallel forever instead of converging to points on the horizon. You could say isometric is more abstract than perspective, which is fine with me. But more importantly, unlike perspective, which requires you to make a choice about how you view the object from what in principle is an infinite range of possibilities—what angle in the horizontal, what angle in the vertical, how near or far—isometric limits how you view the object to eight possible views, and given the nature of the object you probably choose between only two of them. Both views would show the top and the front, and you choose between showing the left side or the right side. And in isometric you have no choice in how close or how far you are from the object. As you know from my interest in trying to get rid of choice in making work, the extreme limitations in isometric are fine with me. In fact at the time I started working with isometric I could hardly believe what an astonishing thing it was, and with the greater understanding I have gained over the years about what isometric implies, I feel that way even more today. At any rate, when you draw a circle on the face of an object in isometric, the circle is an ellipse. It’s not just any ellipse, it’s an ellipse of a precise size that is determined mathematically. By size I don’t mean its dimensions, I mean its degree. The bigger the number expressing the degree, the more the ellipse approaches a circle, that is, the taller it gets in relation to its width. The biggest possible number to express the degree of an ellipse is 90, which in fact is a circle, a special case of an ellipse, one where the two foci coincide. The smaller the number of the degree, the more squished the ellipse is in the vertical, that is the less its height is in relation to its length. As you no doubt know, a degree is further divided into 60 minutes. And what is the degree of the ellipse for a circle in isometric? 35 degrees, 16 minutes. The word that comes to mind is uncanny. Of course I don’t understand the mathematics of it, I just know what the result is. Just as there are templates for drawing ellipses of different degrees—and these are usually even degrees, 30, 40, 50, and so on—there are also templates for drawing isometric ellipses, which of course are 35 degrees 16 minutes. I used such templates, which I still have, in making the circles in my isometric drawings, and most of the subjects that were circular, in fact I think all of them, were related to film, either cans that contained rolls of film or spools of film. Of course these numbers, expressing the degree of an ellipse for drawing a circle in isometric, are a sign for isometric itself. So on the one hand 16 and 35 refer to film, the medium I had first worked in, and on the other hand they refer to isometric, a technique which, in limiting choices and being impersonal, foretold much of what was to come in my work other than in film. And there they were, brought together in the size of my shirt, which is to say in my physical person, which I did not choose. Never mind that a shirt this size did not fit as well as it could, it fit well enough to allow the gesture. I note that despite their seeming to be disparate film gauge and isometric have in common the idea of giving up control and choice. You can’t make your own film gauge, you have to choose one from a very limited range. For someone like me making independent experimental films there was really only one choice, 16mm, which is to say no choice at all. And in isometric you give up the freedom to view the object however you may like and instead chose from very few possibilities. But for me this surrendering of choice is not a limitation but a virtue. It accords completely with my interest in finding ways to make work that are impersonal. But as much as I wanted to recognize that these two areas of my work, film and not film, sharing limited choices and the impersonal, met in the size of my shirt, I finally realized that it was more important for the shirt to fit. Now the sleeves are a little longer but they’re still a standard size. 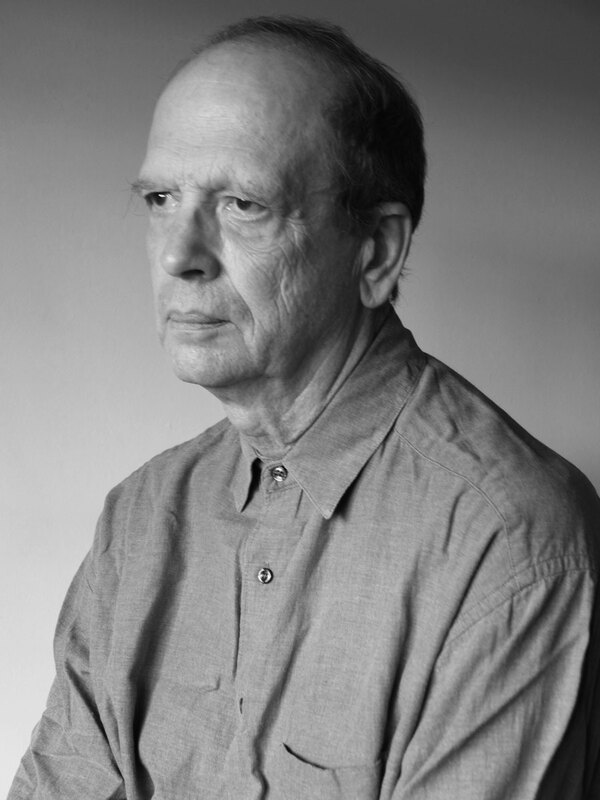 Morgan Fisher, who was born in 1942, emerged as a prominent and continually influential figure within a generation of conceptual artists, filmmakers and writers based in Southern California.